Older adults can lose body heat fast – faster than when they were young. Changes in your body that come with aging can make it harder for you to be aware of getting cold. A big chill can turn into a dangerous problem before an older person even knows what’s happening. Doctors call this serious problem hypothermia. 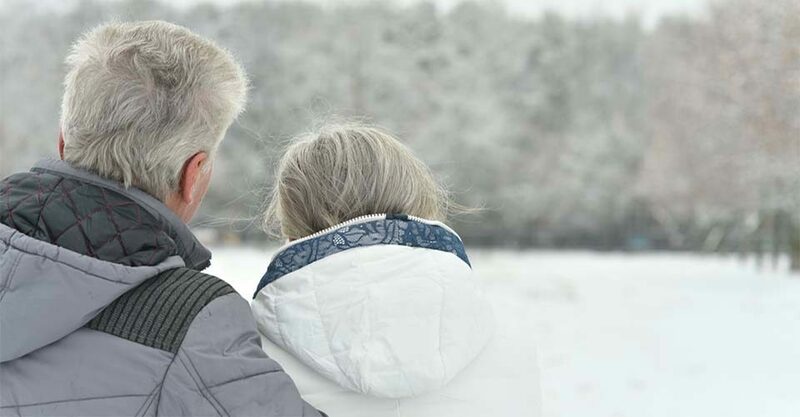 Icy conditions make can lead to serious injuries – especially for seniors. Dress for Warmth – Cold temperatures can lead to frostbite and hypothermia — a condition where the body temperature dips too low. According to the CDC, more than half of hypothermia-related deaths were of people over the age of 65. Don’t let indoor temperatures go too low and dress in layers. When going outside wear warm socks, a heavy coat, a warm hat, gloves and a scarf. In very cold temperatures, cover all exposed skin. Use a scarf to cover your mouth and protect your lungs. Your body temperature should never dip below 95 degrees — if it does get medical assistance immediately. Check the Car – Driving during the winter can be hazardous for anyone. But it is especially dangerous for older people, who may not drive as often anymore or whose reflexes may not be as quick as they once were. Get your car serviced before winter weather sets in — or ask a family member to bring it to a garage for you. Checking things like the oil, tires, battery and wipers can make a big difference on winter roads. Also make sure your AAA membership is up-to-date in case of emergencies. Make sure to wear shoes with good traction and non-skid soles, and stay inside until the roads are clear. Replace a worn cane tip to making walking easier. Take off shoes as soon as you return indoors because often snow and ice attach to the soles and, once melted, can lead to slippery conditions inside. Prepare for Power Outages – Winter storms can lead to power outages. Make sure you have easy access to flashlights and a battery-powered radio in case the power goes out. Stockpile warm blankets. Longer power outages can spoil the food in your refrigerator and freezer so keep a supply of non-perishable foods that can be eaten cold on hand. If the power goes out, wear several layers of clothing, including a hat. Move around a lot to raise your body temperature. Eat a Varied Diet – Because people spend more time indoors and may eat a smaller variety of foods, nutritional deficits — especially Vitamin D deficiency — can be a problem. Nicole Morrissey, a registered dietician in southwest Michigan, recommends consuming foods that are fortified with Vitamin D, such as milk, grains and seafood options like tuna and salmon. Prevent Carbon Monoxide Poisoning – Using a fireplace, gas heater or lanterns can lead to carbon monoxide poisoning. Ensure your safety by checking the batteries on your carbon monoxide detector and buying an updated one if you need to. Fight Wintertime Depression – Because it can be difficult and dangerous to get around, many seniors have less contact with others during cold months. This can breed feelings of loneliness and isolation. To help avoid these issues, family members can check in on seniors as often as possible; even a short, daily phone call can make a big difference. Seniors can also arrange a check-in system with neighbors and friends, where each person looks in on one or two others daily. The most important tip to keep in mind during the colder months is to ask for help. If you need to clear your property of snow and ice, don’t hesitate to ask a family member or neighbor, or hire a professional. Arrange rides to the grocery store and doctor’s appointments-many communities have shuttle services specifically for seniors. Finding a caregiver to assist your senior on a regular basis can also help keep them safer all year round. Don’t be afraid to reach out for help. Wintertime certainly poses challenges for seniors, but with a bit of planning and awareness, you will stay healthy and experience the joys of springtime soon enough. Pace Medical Equipment & Supplies is a family company who can partner with you to provide for your home safety and homecare needs. Pace is a premier provider of lift chairs, scooters, power chairs, incontinence supplies, hospital beds, bath safety items and much more. Contact us for information from our knowledgeable staff or visit us today.